Sat on this too long, even had the form open, went to bed thinking I'd decide in the morning. Congrats though, it's a nice looking board. All invoices have been sent out. Feel free to contact me with any corrections. You will have 48 hours to pay your invoice before I cancel it. If all 75 fail to pay, I'll reopen the GB to fill the missing spots. If you will an empty spot you will be invoiced immediately and you will take the # for that spot. If we do not end up with 75 total orders, the price will not be affected. The price is set to $250. The order will be submitted to the manufacturer on May 2nd. Thanks for joining! I'll be posting updates in this thread as I have more information . Thanks for the suggestion, did that and got a spot. Paid for as well! Thanks for all the concise info. Base on the pictures of the plate, am I right to say that if my plan is to use a DZ60 PCB with the below layout, I'll need to grab the DZ60 plate from KBD? U can't use the dz60 plate. The plate here is different. I see. So I can use the dz60 plate but basically I'm stuck with the plate layout here? You can use the DZ60 PCB yes, but you are stuck with the available plate options (unless you get one custom made). Thanks for the replies! Will make do with fn layer for the arrow keys in that case. Damn, my # changed to 44 now. That's very bad luck in Asian culture lol (signifies death). I would like number 44 actually. If we could I'd probably swap ya lol. Just let me know if you guys plan to swap numbers so I can record it. If you guys want to trade with each other that's fine with me . I think it makes the GB more fun for all involved! Cool. I was half-joking but this is great haha. Since you said it, I'll throw it out there: 5 is my favorite number so if anyone who has #5, #55 or the final numbered slot and want to swap with me (#37 I think, if I'm reading the list right) I'd be happy. No pressure, if you don't want to that's fine too. I'm looking for #13/#19 If the holders are keen to swap for #72. 6 open spots for the following numbers. #3, #28, #29, #34, #36, #38. You will not be able to transfer into any of these spots for the moment. Diggin the #3 since its my lucky number, while im sitting at #5. But im happy either way. Hope the person who will claim it willing to swap. #3, #28, #29, #30, #34, #36. I'm sitting at #54 which isn't a bad number. I'd ideally want #6 as that's my favorite number so #6 if you wanna trade let me know! I guess geekhack doesn't have like pinging capabilities but Itsundone if you wanna change let me know. The list is offset by 1 since the header begins on Row 1, so Itsundone is actually #5. Ah good catch I missed that. So I actually need to swap with One of magicpretzel's boards. I'll shoot him a PM on reddit. Put in for a black wkl, hoping to receive invoice soon! Spot #65 is now up for grabs. Other spots form earlier have been filled. Can I have spot 69? Would 37 be willing to swap? I would, I'm looking for slot 5 or 55 though. I don't think slot 5 holder is willing to swap, and slot 55 holder is someone over at KBDLabs which poses a problem since I don't speak or understand Korean meaning I'm not sure how to contact them to ask. edit: Which number do you have? It seems some people are having difficulty determing their order number from the order check spreadsheet. If you look, you will see that Row #1 is the HEADER. To get the number for your keyboard, subtract 1. The operation is: weightNumber = rowNumber - 1. Please let me know if you need help determining the number on your weight. I will be happy to perform the above calculation for you. this is too much to comprehend can you draw out a flow chart with decision trees? What about a form where you can submit the row number and the form does all that complex math and returns your engraving number. Yeah, whoever did that is a genius. 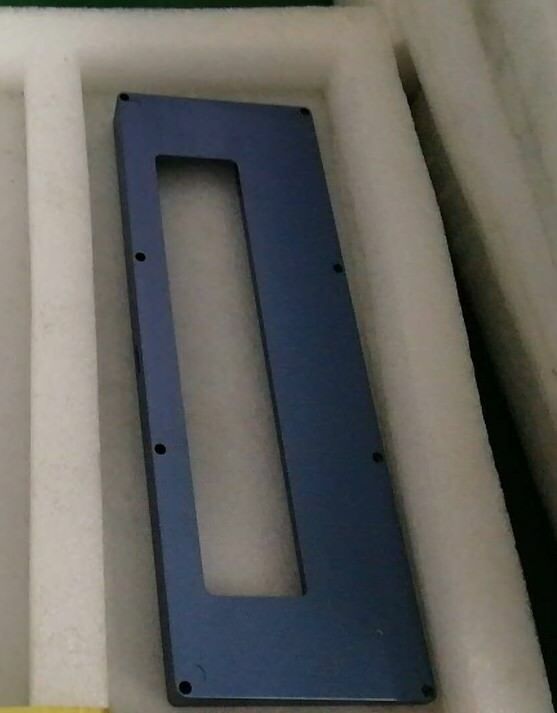 As promised I have received photos for the Blue Gray sample. I won't be able to get any more photos since the factory is on Holiday for a few days now.